As her last name suggests, AnnMarie is the daughter of Craig Diez. Growing up in the real estate world since the age of four, AnnMarie has developed a firm grasp on the ever-evolving real estate market and is thrilled to continue to expand her knowledge in this exciting field. AnnMarie previously worked as a Marketing Coordinator for Coldwell Banker Residential Brokerage’s corporate office in the Bay Area, where she handled office and agent advertising, creative copy, company and networking events and much more for offices throughout Northern California, Utah, Hawaii, and Colorado. Her past experience has made her a natural fit for her current role as Client Development & Marketing Specialist. AnnMarie brings with her a wealth of marketing and client relations experience and is passionate about using her marketing skills and creativity to help showcase and differentiate the homes of valued clients. 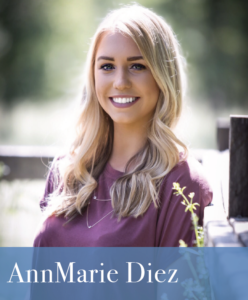 AnnMarie looks forward to working with Diez & Sigg Properties for years to come and combining the two things she’s most passionate about – people and putting her creative mind to work. In her downtime, this Sacramento native enjoys spending quality time with her family and friends, taking her beloved Chihuahua-pug mix Poppy on walks and errands around town and exploring the Sacramento area and its ever-growing arts and culture scene. AnnMarie is a graduate of the University of California Santa Barbara, with a B.A. in Communication. Please fill out the below information and AnnMarie will be in touch with you shortly! "We used Craig to sell our house and to purchase the house we moved into. The process of selling our house could not have seemed any easier for us and... continued"